This time of year seems appropriate to talk about vision for various reasons. On the physical level, the health of your eyes is a precious thing you may take for granted especially when they don’t give you any trouble. However, they can affect your overall health depending on how you use them in your everyday activities. Neck craning forward or head tilting back while slouching at the computer for instance can actually create compression or over-extension of the back of your neck and rounding your shoulders. On the mental level, you envision a specific future for yourself. 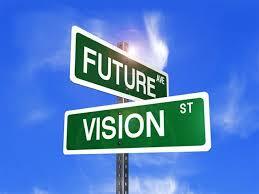 New Year’s Resolutions for example require you to have a vision of the future you want to see happen. Or you may have a personal vision on a work project or on how to solve a given issue. Such vision guides what you manifest in your life or not. Spiritually, vision is a reference to your ability to see with your intuitive heart beyond what is visible. It refers to your inner vision. Yoga teachers may talk about “Drishti” (vision), and on the mat, they often refer to it as a form of gazing in the distance to focus your mind in the present moment. Focus is fundamental in yoga practice. Focusing your eyes and your attention is using this yogic technique called “Drishti”. However, although using your vision to stay in the now or come back to it is an excellent tool, there is something important to consider in “Drishti”. Along with this intention to gaze so as to step out of your over-active mind, you need to always make sure the gaze direction does not lead you to sacrifice your spinal length so the kundalini energy can flow through it. The woman in the triangle pose above is using her vision well to support an integrated triangle pose. As she is looking towards the tip of her fingers and beyond, her head neck and torso remain nicely aligned. However, there is more to good postural balance than perfect alignment, there is dynamic alignment. Dynamic postural alignment implies the harmonious relationship between the various part is respected so that the energy can flow back and forth through the muscles into the support and up the skeleton then able to expand in its full space. Straining interferes with getting the benefit of any yoga pose. Having space to release while in a pose is the most dynamic way to engage in a pose. It challenges the muscles to work without adding body stiffness to the mix. If you have gone to a place where release into your support is no longer an option, you are doing too much. These women engaged in a seated twist are using their vision to lead their seated twist as they stay balanced and centered above their supported sits bones. Led by the direction of their vision, each is going as far as they are comfortable without sacrificing their skeletal height. On the other end, the instructions for the seated twist on this picture are incomplete and it shows on the model illustrating this pose. The sits bones are arched a bit like a rocking chair so it is not enough to feel your sits bones, it is crucial to be aligned above their balancing point. Otherwise, any attempt at releasing your back will take you into a slouch. Here it is clear that she is not balanced because her gravity line is behind her sits bones. As a result, she is slouched in her twist. It is straining her back, squishing her internal organs, limiting her breathing and how far she can go into her seated twist. Although she certainly seems like a happy camper on this picture, she is not getting the best out of her yoga pose! Even in daily life, you need to know how to do this. Whether you are siting on a chair or in a car, you can hurt your neck if you do not apply these principles as you turn your head to look behind yourself. 1) To maximize a seated twist, connect to the balancing point of your sits bones so your head is still above them without loosing your skeletal height which comes by sending your sits bones into your support rather than tensing your back muscles. Then look in the direction you are turning moving from the joint at the top of your spine first. As you go, keep releasing neck and back muscles straight into your support. This prevents you from creating body stiffness or muscle straining. 2) Do not fix your gaze, a fixed gaze creates a fixed body which is not the purpose of yoga, keep it soft and wide using your peripheral vision as in driving. Keep it connected to the rest of you! You are on the mat to stay present and to tune in, not to tune out! 3) When doing asanas, just do asanas. Don’t start to think about the meaning of life or anything else but what is happening right there and then. Your vision, your breath, your kinesthetic senses are all ways to anchor yourself in the present moment. 4) The spiritual dimension of “Drishti” can only come from the practice of being present yet non attached to thoughts, body senses and sense pleasures. Mind grasping or muscular grasping (the two sides of the same coin) take us away from such practice. So stay in touch with yourself and don’t tense your muscles. Body stiffness is not body strength. Body strength remains flexible, like the strength of the cat! 5) Stay aware of the direction of your vision as often as possible. When lost in your thoughts or in your body feelings, you may be gazing in a way that stiffens your neck. So watch out for your neck by making sure your vision choice does not conflict with the need of your neck to stay free of tension. This will give you an integrated movement connecting you from head to toes. filled with Gratitude, Health, Prosperity and lots of Laughter!